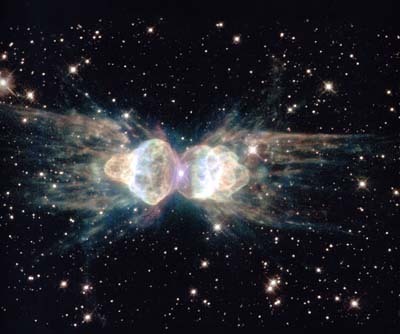 The Ant Nebula is one of the most striking planetary nebulae known. Planetary nebulae - whose name arises because most are spherical and looked like planets when they were first discovered through older, less powerful telescopes - are glowing structures of gas cast off by solar-like stars at the ends of their lives. The morphology of the Ant Nebula - a bright core, three nested pairs of bipolar lobes and a ring-like outflow - is so unique that it was nicknamed the 'Chamber of Horrors' of planetary nebulae in the late 1950s. The Wilson festschrift has arrived! Slightly more than fifty years ago a significant advance in the systematics of ants was published - E. O. Wilson's doctoral thesis: A monographic revision of the ant genus Lasius (Wilson, 1955). This was not quite Ed's first paper on formicid systematics (Wilson, 1951, 1952), but it was the first comprehensive revision of an ant genus based on modern or Mayrian taxonomic principles. Ant systematics had truly entered the modern era only five years earlier with W. S. Creighton's revolutionary Ants of North America (Creighton, 1950). Creighton emphasized the need for species and subspecies based on solid morphological features and sound field experience. Creighton's work clearly influenced Borgmeier's massive revision of the New World army ants (1955). Enlarging upon Creighton's philosophical understanding that taxa must be based on secure morphological differentiation and that species must be understood as populations subject to (often) considerable geographic variation, Wilson's revision, following on Creighton's monumental accomplishment, effectively ended the era of such giants as Forel, Emery, and Wheeler. Each of these workers had described numerous subspecies and varieties, often from inadequate samples; these new taxa were all too frequently ascribed to species that were, themselves, poorly known. Creighton had dismissed the varietal form, the backbone of the quadrinomial system then applied to ants. Some of the "varieties" he did continue to recognize as geographic variants or subspecies, usually based on morphological characteristics; most, however, were consigned to oblivion as nothing more than trivial sporadic variations within a population. Only five years later, Wilson took the next step and dispensed with subspecies, having determined that most ceased to exist as taxonomically meaningful entities when entire populations were critically examined. I first began studying ants, as part of my larger interest in the aculeate Hymenoptera, in the years just prior to the appearance of Creighton's book. Suffice to say that when I first realized just how chaotic ant taxonomy was, I promptly determined not to work on ants. Some years later I acquired a copy of Ants of North America, but by then I was deeply involved with bees and social wasps, and had only a casual interest in ants. It was not until about 1960 that I became more involved with ants. Ants of North America was supplemented by reprints of more recent works, including Ed's Lasius monograph. Suddenly, ant systematics, a previously arcane welter of confusing subspecies and varieties and wholly unworkable keys, had become comprehensible! Those individuals entering ant systematics over the past half century cannot begin to comprehend the profound significance of these two publications. But now, fifty years later, we can look back and appreciate Ed's contributions, examined more fully in the following paper, to our field of endeavor. The present volume, containing contributions from ant taxonomists the world over, began as a chance email interchange between Jack Longino and myself in the spring of 2003. Basically, it was something on the order of (from Jack): "Maybe we should put together a Festschrift for the Old Boy (i.e., Ed)." My response was, "Not a bad idea." We left it at that and signed off. The idea didn't die there. Phil Ward, who happened to be visiting the LACM at the time, and I started talking about it and shortly agreed in principle to explore the possibility. I immediately began contacting colleagues and potential contributors; most were enthusiastic and agreed to provide papers. A lot of hard work by Ed's colleagues from around the world has resulted in this volume. There are a couple of thoughtful essays, one from Barry Bolton, another from Bob Taylor. Another paper examines the great diversity of ant species in arid lands in Australia. But the papers submitted here are primarily taxonomic/systematic in nature. All of the papers included herein have been reviewed by the editors and, sometimes also by the usual battery of "anonymous reviewers." I wish to thank two of my colleagues at the Natural History Museum of Los Angeles County, Brian V. Brown and Fred S. Truxal, for their encouragement. Particular thanks are tendered to my son and grandson, Gordon and James, respectively, and to Weiping Xie and Bill Mertz who came to my assistance many times when my ineptitude with computer technology became all too evident. And finally, I and my co-editors, Phil Ward and Brian Fisher, wish to express our profound gratitude to all the authors whose contributions made this volume possible. Crocodiles are widely distributed and can usually be found in remote areas, however very little is known about their movements on a larger scale. In this study, Read and colleagues (including the late Steve Irwin) use satellite tracking to report the movements of three large male crocodiles, which were relocated up to 411km from their capture sites in Northern Australia. The results show that each crocodile returned to its original capture site within days, indicating that homing abilities are present amongst crocodiles. Can you imagine anyone doing this work without Steve Irwin? Who else would be able to grab a big croc, attach a satellite tracker, load it and unload it some hundreds of miles away, then follow their movements on the computer screen? Would you dare ask your grad students to do that? Abstract Ants are one of the most studied insects in the world; and the literature devoted to their origin and evolution, systematics, ecology, or interactions with plants, fungi and other organisms is prolific. However, no consensus yet exists on the age estimate of the first Formicidae or on the origin of their eusociality. 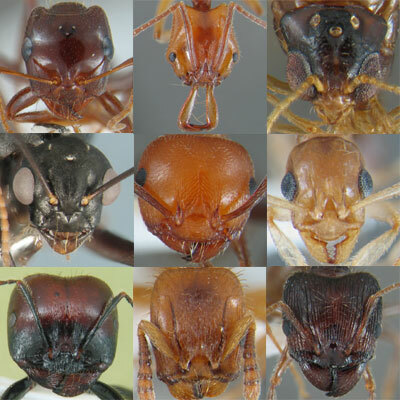 We review the fossil and biogeographical record of all known Cretaceous ants. We discuss the possible origin of the Formicidae with emphasis on the most primitive subfamily Sphecomyrminae according to its distribution and the Early Cretaceous palaeogeography. And we review the evidence of true castes and eusociality of the early ants regarding their morphological features and their manner of preservation in amber. The mid-Cretaceous amber forest from south-western France where some of the oldest known ants lived, corresponded to a moist tropical forest close to the shore with a dominance of gymnosperm trees but where angiosperms (flowering plants) were already diversified. This palaeoenvironmental reconstruction supports an initial radiation of ants in forest ground litter coincident with the rise of angiosperms, as recently proposed as an ecological explanation for their origin and successful evolution. Volume 10 of the Myrmecological News is out and online! Paper and digital version (printable .pdf-files; exclusively for personal use) are available for € 20 each (€ 10 for members) from OEGEF (Austrian Society of Entomofaunistics). P.S. : Please forward this message to others who might be interested. Thank you! Images via the New York Times, story here. I totally had this idea five years ago -- I was going to put all my new ant species up on ebay and auction off the rights to name them to the highest bidder. I'm low on funds, and flush with unnamed new species, so... why not? Just an idea, of course. From Nature: Over the years, philanthropists have lent their names to art galleries, schools and hospitals. But in a watershed auction, the world's rich will be able to add their names to several new species of fish — all in the name of charity. On Thursday 20 September, an auction to name ten new species of fish is being held by the Monaco-based Monaco-Asia Society, a non-profit organization devoted to Asian causes and Conservation International, based in Arlington, Virginia. The fish are a few of the dozens discovered by Conservation International during expeditions to reefs off the coast of Indonesia's Papua Province in 2006. Bidders will arrive from around the world for a gala at Monaco's Oceanographic Museum, which sits on a bluff high above the Mediterranean Ocean. Prince Albert II will be in attendance, and auction house Christie's will oversee the bidding pro-bono. This isn't the first auction for a species name. For example, in 2005 an anonymous online bidder won the right to name a new kind of Bolivian monkey for a charitable donation of US$650,000. But this is the first time that multiple species will be auctioned in a single event, according to Monaco-Asia Society president Francesco Bongiovanni. There's nothing wrong with naming an animal after the rich and famous, says Andrew Polaszek, executive secretary at the International Commission on Zoological Nomenclature in London. The only technical requirements, he says, are that the name must have a generic and specific part and be published in a paper or monograph — something that Conservation International will presumably do. Species are routinely named after famous scientists, and one species of cave beetle is even named after Adolf Hitler. He says that "you can essentially name a species anything you want". Bongiovanni says he hopes the gala will raise US$1.2-1.4 million for further expeditions and conservation efforts in the region. But is it fair to name a species after a wealthy patron, rather than the scientist who discovered or described it? Bongiovanni says yes — especially because it is all for the greater good of the fish. "At the end of the day," he says, "these species need names." A new study led by the University of Colorado at Boulder indicates biologists trying to save Colorado's native greenback cutthroat trout from extinction over the past several decades through hatchery propagation and restocking efforts have, in most cases, inadvertently restored the wrong fish. According to a sophisticated DNA analysis, five of nine "relic" populations of what biologists believed to be greenback cutthroat trout living in isolated pockets of the state actually are Colorado River cutthroat trout, a closely related subspecies, said lead author Jessica Metcalf, a researcher in CU-Boulder's ecology and evolutionary biology department. Eggs and sperm from the trout populations have been used for the last several decades to rear new generations in hatcheries, allowing state biologists to restock parts of Colorado with what they thought were greenback cutthroats, she said. The new study, which included sequencing and analyzing mitochondrial and nuclear DNA, showed the majority of the greenback populations had been misidentified, and that the greenback cutthroat trout range is now restricted to just 11 miles of streams in several remote areas of Colorado. Asahi Shimbun reports that a woman in Osaka discovered these pretty katydids in a field. Osaka Museum of Natural History entomologist Itaru Kanazawa identifies them as the larvae of Euconocephalus thunbergi (”kubikirigisu” in Japanese), a close relative of the katydid. While he says it is normal for these insects to change between green and brown to match their surroundings, pink and white are considered abnormal. How many ants do you care for at the moment? Why do you like ants? Which ant achievement admire you at most? Which characteristics estimate you with ants at most? Your most beautiful moment with ants? Your favourite heroines in ant-world? Which is the biggest misunderstanding about ants? Kari Ryder Wilkie bloggt im Antroom. Dort beschreibt sie die Fortschritte in der Bestimmung der Ameisenfauna rund um die Tiputini-Biodiversitäts-Station in Ecuador und auch alles andere Ameiseninteressante. Nachdem ich so oft auf sie verlinkt habe, nun also der Ameisen-Questionnaire für Kari Ryder Wilkie. 1. Um wieviele Ameisen kümmern Sie sich? Ich habe 100.000 einzelne Ameisen in meiner Sammlung, 7500 auf Nadeln gespiesste Exemplare, 500 Arten aus 63 Gattungen. Keine ist lebendig, so sind sie leicht zu pflegen. 3. Welche Leistung von Ameisen bewundern Sie am meisten? 4. Welche Gabe der Ameisen möchten Sie besitzen? Stärke und Ausdauer – sie finden fast überall einen Weg zu überleben und zu gedeihen. Der tag, an dem mein mann mir einen Antrag machte – eine Straße Blattschneiderameisen trug Rosenblüten über unseren Weg. 6. Welches ist der größte Irrtum über Ameisen? Dass sie langweilig und eklig sind. Man sieht es, wenn man nah herangeht: Sie können schön sein, furchteinflößend, elegant und reizend. he pulled a couple of G. moelleri from my group of G. striatula. "These two species can sometimes be hard to tell apart, especially the smaller G. moelleri can be easily confused with G. stritula. The one character that seem to help is the gauge of the seta (longer hairs) on the body dorsum. They are noticeably thicker on moelleri than striatula." I myself do not see much of a difference, aside from them moelleri being a bit larger, but there you go. A group of ants I had labeled KTRW-002 (also Mystery Ant #4) he identified as G. mina. Originally I had 4 specimens of sulcata and noted that there are two distinct groups. One group is larger with the mesosoma the same dark color as the head. This group was collected in the canopy. The second group is slightly smaller, with the mesosoma varying from a yellow/orange color to brown (sometimes on the same specimen). Head is still black. All of these specimens were collected from a pitfall trap. They all keyed out very clearly to sulcata, though, so I put them together. Dr. Lattke split them up. "It is probable that a combination of molecular and morphological methods will be needed to clear things up, plus a lot of collections from all over [speaking of striatula]. The same situation holds for G. sulcata, which is another complex complex of species! I have unfortunately made things worse in the Festschrift key by mixing up the character that separates sulcata group from ericae! The petiolar node for sulcata should have its posterior face transversely costulate; and the node in ericae should be longitudinally costulate in posterior view. I had this correct in the revision, but inverted it in the new key. The sulcata in your collection are defintely two different things." I also had a couple of weird specimens that keyed out to striatula but which looked odd enough to me that I pulled them aside to deal with later. Dr. Lattke agreed that they were almost certainly two new species of Gnamptogenys. "You do have what seem to be undescribed species in the striatula group. I put “a” and “b” labels on them. G “a” is new on account of the shape of the petiole, the narrow propodeal dorsum and the flattened surface of abdominal tergite III. G “b” is new on account of the narrow rectangular head and the transversely costulate propodeal declivity." I will post photos of these new species to my website as soon as possible. 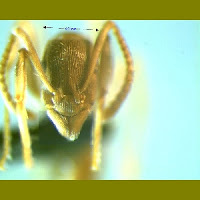 The image above is a poor photo of species "b"
It seems that hormigas.org updated its interface last March (2007). 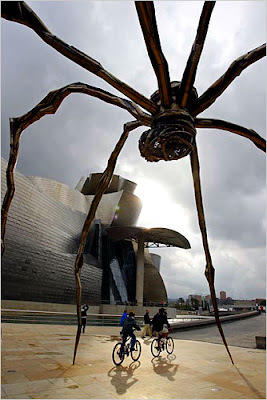 The site is devoted to the ants of the Iberian Peninsula (Spain and Portugal) and its curated by Kiko Gómez and Xavier Espadaler. It is now a site easier to navigate and its data is now handled with a proper built-in database. 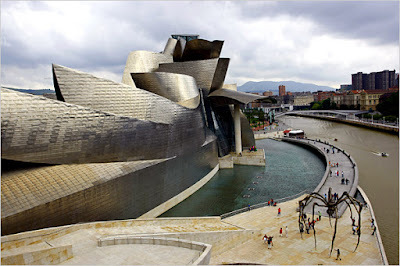 It is also a pleasant-looking site with a simply design. Looking at their ClustrMaps site counter it is interesting to note that the bulk of the site's hits come from Latin America. This is not surprising given that the site is one of the few such sources in Spanish. The general information on ants provided by hormigas.org is of universal use of course (classification, glossary on ant anatomy, etc). However it does shows the need for such sites and web-resources for Spanish-speakers interested in the native ants of the vast and species rich Latin American region. It is not unusal to write an obituary when a great scientist passes away. It is much more unusual to do so when a lab animal does so. But when that animal is not just an experimental subject, but also a friend, colleague, teacher and collaborator, than the species boundaries lose importance. And Alex, the famous African Grey Parrot, was just that, and more, to Irene Pepperberg and to the entire field of cognitive ethology. He died yesterday, unexpectedly, at the age of 31 (about half the normal life expectancy for the species) and he will be sorely missed. You can send donations, that will assure the research goes on with Alex's younger buddies Griffin and Wart, to the Alex Foundation. 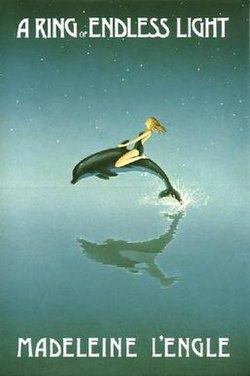 I am deeply saddened to learn of the death of one of my favorite childhood authors, Madeleine L'Engle. Madeleine L'Engle (November 29, 1918 – September 6, 2007) was an American writer best known for her children's books, particularly the Newbery Medal-winning A Wrinkle in Time and its sequels A Wind in the Door, A Swiftly Tilting Planet and Many Waters. Her works reflect her strong interest in modern science; mitochondrial DNA, for instance, is featured prominently in A Wind in the Door, tesseracts in A Wrinkle in Time, organ regeneration in The Arm of the Starfish and so forth. She died at a nursing home in Connecticut at age 88. I share Einstein's affirmation that anyone who is not lost on the rapturous awe at the power and glory of the mind behind the universe "is as good as a burnt out candle." Infinity is present in each part. A loving smile contains all art. The motes of starlight spark and dart. A grain of sand holds power and might. The world of science lives fairly comfortably with paradox. We know that light is a wave, and also that light is a particle. The discoveries made in the infinitely small world of particle physics indicate randomness and chance, and I do not find it any more difficult to live with the paradox of a universe of randomness and chance and a universe of pattern and purpose than I do with light as a wave and light as a particle. Living with contradiction is nothing new to the human being. Truth is eternal. Knowledge is changeable. It is disastrous to confuse them. Charles Darwin first became interested in entomology during his childhood, and this interest grew into a beetle-collecting obsession during his college days. Following the voyage of the Beagle, his focus on insects shifted from collecting specimens to searching for insect observations that supported his theory of natural selection as proposed in On the Origin of Species. Initially, Darwin believed that entomologists were opposed to his views. Using Darwin's correspondence, I will show that his perception was based, in part, on three reviews, including one that he erroneously attributed to an entomological critic, and that not all entomologists were opposed to his ideas. Henry Bates, discoverer of Batesian mimicry, voiced his support of Darwin in his papers and during meetings of the Entomological Society. In America, entomologist Benjamin D. Walsh wrote Darwin in 1864, expressing his support and promising to counter any anti-Darwinian attack, and by 1868, Darwin was enjoying significant entomological support on both sides of the Atlantic. After his death in 1882, Darwin's supporters gained influence in Britain and the United States, completing entomology's shift to a Darwinian perspective. Expected online publication date for the Annual Review of Entomology Volume 53 is December 3, 2007. Please see http://www.annualreviews.org/catalog/pubdates.aspx for revised estimates. Evolutionary Biology of Insect Learning. Learning and memory, defined as the acquisition and retention of neuronal representations of new information, are ubiquitous among insects. Recent research indicates that a variety of insects rely extensively on learning for all major life activities including feeding, predator avoidance, aggression, social interactions, and sexual behavior. There is good evidence that individuals within an insect species exhibit genetically based variation in learning abilities and indirect evidence linking insect learning to fitness. Although insects rely on innate behavior to successfully manage many types of variation and unpredictability, learning may be superior to innate behavior when dealing with features unique to time, place, or individuals. Among insects, social learning, which can promote the rapid spread of novel behaviors, is currently known only from a few well-studied examples in social Hymenoptera. The prevalence and importance of social learning in insects are still unknown. Similarly, we know little about ecological factors that may have promoted enhanced learning abilities in insects, and whether learning has significantly contributed to speciation in insects. Expected final online publication date for the Annual Review of Entomology Volume 53 is December 3, 2007. Please see http://www.annualreviews.org/catalog/pubdates.aspx for revised estimates. --Dukas R, Animal Behavior Group, Department of Psychology, Neuroscience & Behavior, McMaster University, Hamilton, Ontario, L8S 4K1, Canada dukas@mcmaster.ca. On Wednesday I went down to the Harvard ant room to chat with Jack Longino, who was in town working on Pheidole. I really wanted a chance to discuss the logistics of dealing with such a large collection. I found his advice very helpful, so perhaps others will, as well. Mistakes -- What do you do with mistakes? I am doing a pin-by-pin inventory right now and have come across a couple of errors. These include having two specimens with the same ID number on them, records with no ant, ants with no record, etc. Not a ton but when you are dealing with over 7000 pinned specimens (forget about the stuff in alcohol) there are bound to be errors. And I tend to obsess about them and over-analyze the significance of my actions, etc. etc. And I really really don't want to have the wrong information in my database. I want it to be perfect. And the truth is it will never be perfect. You just have to look at your mistakes, try to figure out what happened, make your best guess correction, and realize that in the big picture it really won't make a difference in your overall analysis. Which makes perfect sense and sounds very reasonable and kind of makes me wonder why I made such a big deal about it. But I tend to do that, I guess. Reproductives -- I have all these reproductives. Many of them are unidentified. Many of them are identified. I frustrates me greatly that I have all of these unidentified specimens. It also frustrates me greatly that when I do my analyses, the reproductives I was able to identify won't be included. I just wanted to confirm that a) no one expects me to identify all of the reproductives, b) I should not include any of the identified reproductives in the analyses , c) I should stop staring at them and put them away or I will never finish my thesis, and d) even Jack has a big drawer full of unidentified reproductives that he occasionally goes back to over the years. Stopping -- this is my problem. I don't know when to stop. I never feel like I am finished. There are always genera that I don't feel certain about, things I want to re-check. I want everything to be perfect. This is what Jack said: "Don't be afraid to be wrong" and "err on the side of lumping." Because of course it will never be perfect (I should make a plaque that says this and put it on top of my computer so I can stare at it all day long) and you have to stop sometime and at some point you just have to say that you have done your best job and let future taxonomists make any changes if necessary. There is more to say here, but I am going to sign off for now and hopefully continue this post later. "That's life" - is it? In my last blog The dismal terrestrial biodiversity survey record I complained about our leaders inability to kick start a global project to survey terrestrial life. By coincidence, in todays New York Time (Sept 6) you can read an Op-Ed contribution by EO Wilson, "That's life". Compare this with what's written in the article about the new oceanographic campaign mentioned above. Is this science he talks about? Is this something new? Isn't this sort of announcement of 'we create something great ... but you have to do it' exactly the recipe of disaster? The Encyclopedia of Life is a very secretive initiative administering data collected by third parties. There is no substantial budget, nor are science plans there, to create new data. In fact, the proposed support for the affiliated Biodiversity Heritage Library has been cut - the only place, where EOL could have helped to convert existing data into a digital, all accessible and open form. Wilson's own commitment to open access is dubious, and his credentials to develop new ways to provide access to biodiversity data are non existent. Clearly, systematics is big science. More than 6,000 taxonomist work on describing the world in such magnificient institutions like the Natural History Museums in almost any capital of the world and hundreds of smaller insitutions. The raise of the Global Biodiversity Information Facility (an off-shoot of a OECD meagscience program) as a catalyst to make this information accesible is ongoing. But there is also a certain fatigue in the murals of these institutions, that money is not spend on creating new insights but rather to administer these data by third parties and thus siphoning the money from where it better is spent. Taxonomic aata providers which are not the large institution such as Harvard, but individuals working with very little to no support are anxious not to provide data to support institutions like EOL from which they see no return. The faltering Countdown 2010 is just a most typical symbol. There is an international commitment to halt the loss of species by 2010. But there are not tools to measure this, because we still launch new IT initiatives and do not work on the ground, and continue talking about the terrible loss of species. There are ways to be more efficient at very little cost. Open Acccess: Assure, that all the forthcoming taxonomic and ecological literature is open access, either by the green or the gold road. Commit the publishers to insert taxonomic specific tags (such as provided by taxonx the schema), so new names and descriptions can automatically be harvested. Support by our government of Name Registries for all the world orgasnisms, such as IPNI and Zoobank. Provide targeted access to legacy publications, digitize and mark them up, so that they can be harvested, their names, descriptions and distribution records, and provide doi or handles for all of these records. Commit the members of the Conservation Commons to deliver: provide access to their data. Bridge the gap between the conservation, industry and sytematics community, so that a link between data exists. Implement the OECD guidelines to provide access to publicly funded scientific data. We do not need new institutions, we need to strengthen existing one - the US unilaterist attempt in climate change is as much detrimental to the rest of the world's approach (Kyoto protocol) as is EOL to GBIF and its activities. And we really need to go out and collect data - because of empiric evidence climate change and ozone, to name a few, are on the politicians palate, and not anecdotal accounts. I mostly agree with the sentiments expressed here, especially the frustration that is felt by taxonomists (and me) when we see all these press statements and news reports about new initiatives and new conferences and new foundations, all dedicated to identifying all the species of the world, but see nothing actually being accomplished and no actual help to scientists (like me) who are doing this work. Stephen Hawking, author of the multi-million copy bestselling A Brief History of Time, and his daughter Lucy explain the universe to readers of all ages. George's parents, who have always been wary of technology, warn him about their new neighbors: Eric is a scientist and his daughter, Annie, seems to be following in his footsteps. But when George befriends them and Cosmos, their super-computer, he finds himself on a wildly fun adventure, while learning about physics, time, and the universe. With Cosmos's help, he can travel to other planets and a black hole. But what would happen if the wrong people got their hands on Cosmos? George, Annie, and Eric aren't about to find out, and what ensues is a funny adventure that clearly explains the mysteries of science. Garry Parsons' energetic illustrations add humor and interest, and his scientific drawings add clarity; there are also eight 4-page full-color inserts of scientific photos. Looks like fun. Now if only somebody would make a children's book about Schrödinger's Cat, I would really appreciate it. My labmate Noah came back from this year's Ant Course with a wonderful treasure trove of skills and experience that I intend to mercilessly use for my own advantage. 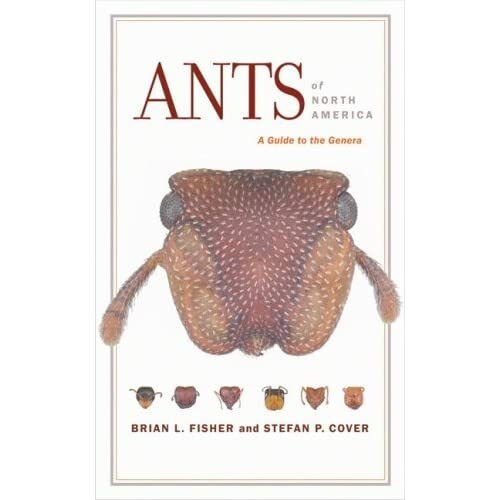 He also came back with a copy of Brian Fisher and Stefan Cover's long awaited Ants of North America: A Guide to the Genera. It is beautiful! It includes keys to 73 genera, 180 color images, and a nice glossary of useful terms. Plus, it comes in a handy portable size and appears sturdy enough to last through a couple of field seasons, at least. You can pre-order them from Amazon for $23.07. You should go do that right now. Git.